Note: I thought this had posted back in November. Apparently not! Well, better late than never. Continuing our series on comic heroes with disabilities, let's look at wheelchair users. Here we have Charles Xavier, Barbara Gordon, Wendy Harris and Niles Caulder and more. Read on. From Marvel we have Professor X, otherwise known as Charles Xavier. Xavier is the leader of the X-Men. He’s an incredibly strong telepath and founder of Xavier’s School for Gifted Youngsters, a refuge for mutant teenagers. Whilst a young man he was injured by an alien called Lucifer, this accident left him paraplegic and he became a wheelchair user. To read about Xavier, we recommend Joss Whedon’s run on Astonishing X-Men. He shows up in the second arc titled ‘Danger’. You could also try the comic adaption of the X-Men film made in 2000, with Patrick Stewart playing the man himself. The comic is fairly faithful to the film and a decent read. I would stay away from the Ultimate X-Men stories because Charles is really not a likeable personality in these stories. Barbara Gordon, once Batgirl, then Oracle now back to Batgirl. Barbara Gordon, Librarian, intelligent, redheaded sidekick to Batman, daughter of Jim Gordon. She was determined to become a crimefighter, so she donned the suit without waiting for anyone's permission. She fought alongside Batman for many years, then the Joker turned up at her house, and shot her in the spine. He didn't know she was Batgirl, he wanted to get back at Jim Gordon. Barbara was left unable to walk and used a wheelchair to get around. Not one to feel sorry for herself she reinvented herself, studied, trained and became the premier information resource for superheroes, taking on the codename Oracle. She is phenomenally talented with computers and is far from helpless. Read about her as Oracle in the Birds of Prey series. 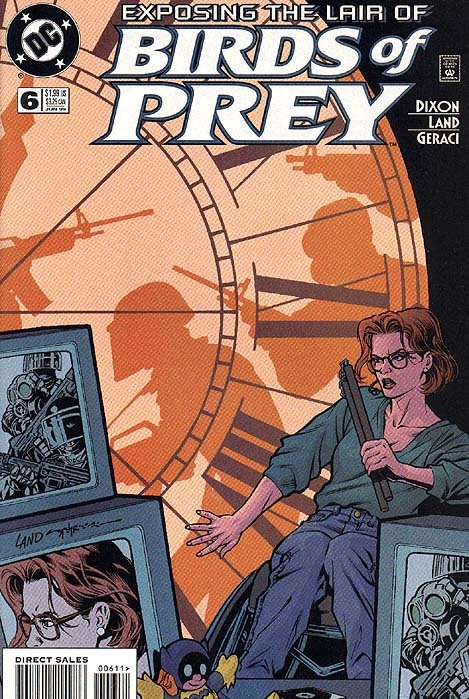 You can buy digital issues on comixology, but if you want Babs as Oracle look for the series titled Birds of Prey: Manhunt or those dated 1999 to 2009, or 2010 to 2011. The 2011 onwards series has Babs back as Batgirl, de-aged and walking again. If you can track down the single issue comic titled The Batman Chronicles #5 (from 1996) you will get a sort of year one origin story for Barbara as Oracle telling how she recovered after her shooting and morphed into Oracle. In a similar vein we have Wendy Harris (on the left, below), one half of the Wonder Twins (not the same Wonder Twins Zan and Jayna who appeared on Smallville). Her brother Marvin was killed by a giant dog in a pretty terrible story arc in Teen Titans and Wendy herself was brutally injured. She ended up, like Barbara Gordon, unable to walk, and took on a sort of junior Oracle role within the DCU. 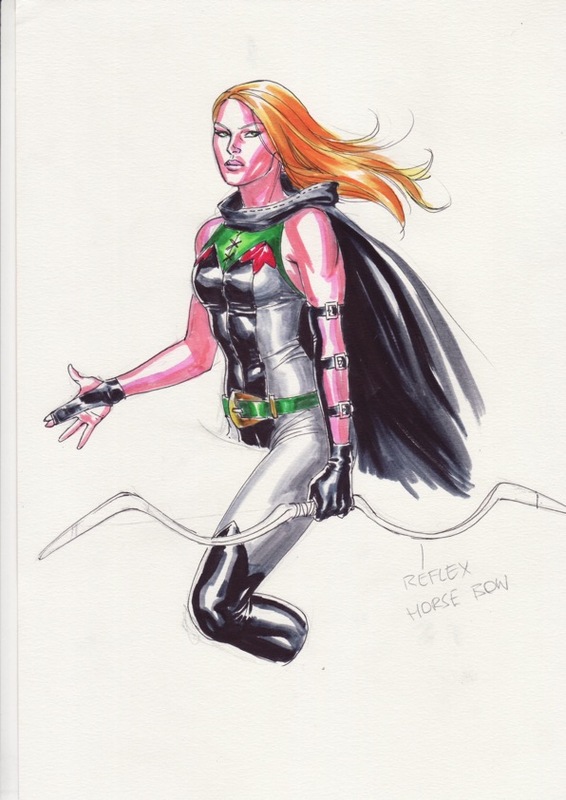 She worked with Barbara and helped out Stephanie Brown, the then current Batgirl. I realise this sounds very similar to Barbara's role, but the characters are different and don't have much in common apart from being good with computers, heroic and using wheelchairs. 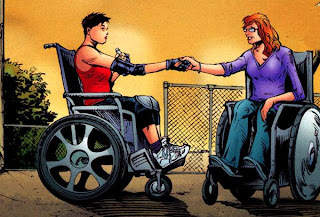 Within this Batgirl series there was discussion over each character's acceptance of their disability, Barbara being much further along than Wendy. The series is very very good and I highly recommend reading it. As the trades are pretty difficult to get hold of, try buying digital copies on comixology. Niles Caulder is the leader of Doom Patrol, an oddball group of heroes that are deemed a little, well weird, by, the rest of the DCU. 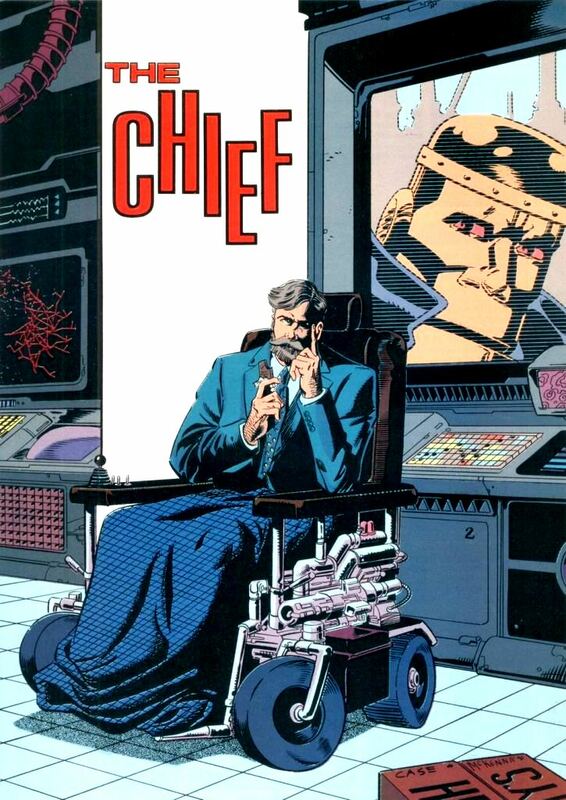 There have been various re-tellings of the Doom Patrol idea, some cast Caulder in a sympathetic light, some that don't. I recommend Grant Morrison's run. In this Caulder is a very intelligent, kindly older mustachioed fellow. The series itself is deliciously weird. The second trade features a gay gorilla in love with a disembodied brain, and a painting that wants to eat Paris. It's not really suitable for kids, or people who prefer simple entertainment. Amazon lists all the available trades. She can ride, but she can’t walk, supported in her saddle by magic and invention. She has an absolute affinity for all horses, and she’s the greatest archer in history. At the time of writing Demon Knights is only 4 issues in, so a good time to jump on. Not much has been revealed about Horsewoman, her motives or background, but she looks to be a pretty intriguing character. The Demon Knights team also includes a female knight disguised as a man and Madame Xanadu. It's a great mix of characters and magic shenanigans. The series is written by a Brit, Paul Cornell, so you won't get any American schmaltzy cliches. You can buy electronic copies from Comixology or you can buy paper copies from your local comic shop. Don't forget our other posts on characters with sensory disabilities and my rather uneloquently described, the rest. I guess Caulder's the better example. In the indie comic world, I've been working on a disabled superhero. In a wheelchair for most of his life, my hero becomes involved in a conspiracy that tests his potential and self-confidence. Can you give us a link to your website or comic Chad? There is a new breed of Superheros with disabilities, Its a brand new comic for kids and adults that celebrate children with disabilities details here re the comic http://www.departmentofability.com/.. Details re the comics charitable aims here http://leahg.me/changing-perceptions-about-kids-with-disabilities-the-greatest-gift-is-our-kids-get-on-board/ Please help promote this worthy cause and ace new comic! !